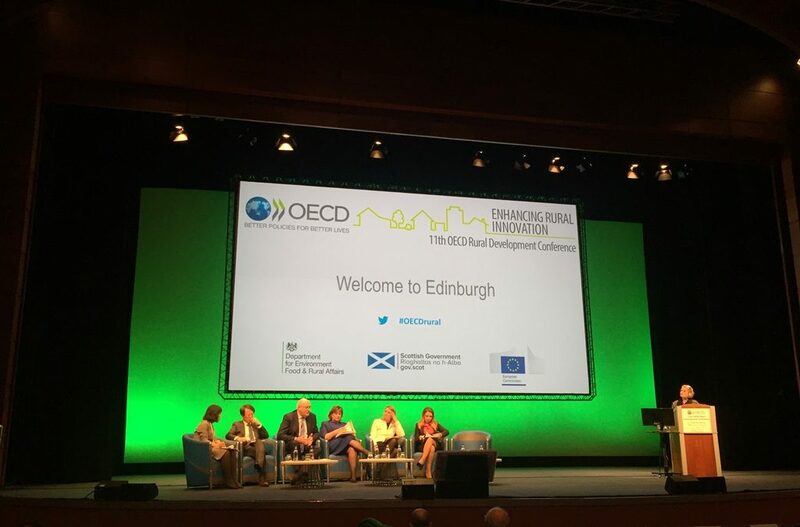 The Network of Sparsely Populated Areas of Southern Europe (SSPA)traveled to Edinburgh (Scotland) to participate in the 11th Conference on Innovation in Rural Development, organized by the OECD (Organization for Economic Cooperation and Development) and translate its proposals to European institutions to reverse the process of population loss and structural problems affecting the rural environment. This event, which took place from 9 to 12 April, served to connect different rural international communities and exchange experiences of successful projects, making innovation the differential element to create opportunities in rural areas. The political declaration that has been signed and that includes the conclusions of three days of work reflects the theses defended by SSPA: defining multisectoral rural development, adopting policies that facilitate entrepreneurship and self-sustainable development so that it can be dispensed with in the future of subsidies, also removing the barriers that prevent sparsely populated regions from diversifying their economy. On the part of the SSPA has assisted the network coordinator, Sara Bianchi, who has indicated that “we have explained to the rest of European countries that from the SSPA we are promoting a clear and better articulated definition of depopulated areas, as well as a policy to achieve a different rural development that is able to reduce the gap that exists between urban and rural areas “. As a representative of the local action groups of the three provinces that make up the interterritorial cooperation project, SSPA Challenge 2021, Sandra Fidalgo, Cooperation Technician of the Association for the Integrated Rural Development of the Jiloca and Gallocanta Lands has attended. Fidalgo has valued the attendance at the conference as very positive, stating that this type of event is the appropriate scenario to value the cooperation between local actors, which serves as a vector to achieve the empowerment of local communities. With this trip to the Scottish capital, the SSPA continues with the European negotiations, some meetings that last year were more oriented to raise awareness about the depopulation while this year they mainly intend to publicize the position of the Network to the member states for that can support it in the face of the negotiations of the EU’s regional policy, a debate that will open in early May in the European Parliament.